Like battle plans, scenarios never survive first contact with the enemy… er, sorry, characters… and it’s always handy to have something to come up with on the fly to cope with untoward choices. Roll your dice and it soon will be THEM dealing with the untoward events! 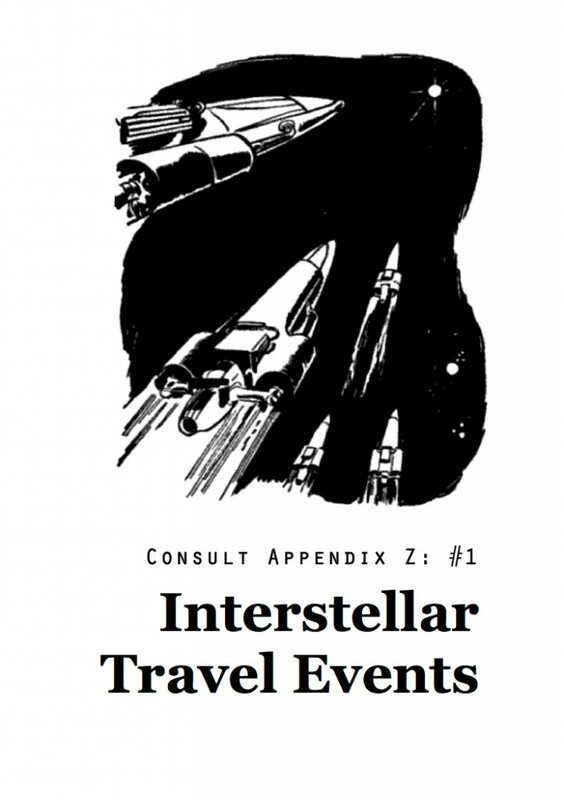 Designed as a generic resource for any game system that accommodates interstellar travel, the concept is simple. Just roll three six-sided dice – either serially, or if you have 3 of different colours, all at once. One gives the section, then another a sub-section within it and the last the detail of whatever is going on. It seems more complex to explain than it is to actually do, sorry. Naturally, you can just read through and select something that seems appropriate, or you may prefer to use this as an aid to adventure planning rather than troubleshooting pesky characters who do not go where you expected! No assumptions are made about HOW you are traveling between the stars, just that you are doing so, hence, there are no jarring references to a specific ruleset. At most you might be ’emerging into normal space’ – but those sort of encounters are ones that occur in the outer reaches of a planetary system so it doesn’t really matter how you got there. It should be a trivial matter to dress your description appropriately to suit however interstellar travel is conducted in your chosen game. The actual events are ones that empower you to either make a full adventure out of dealing with whatever is happening or just mention it and carry on with whatever else you want to happen. There are alien encounters, spacial anomalies, system failures on board ship (including something getting soggy… that bugbear of mine, the ‘inertial dampener’ – why do people think inertia can even get wet?) and some truly weird events. Yes, those inertial dampers got sorted.